Noosa is on the brink of a new chapter! This weekend, over 80% of Noosa people voted YES to de-amalgamate from the Sunshine Coast Council and to once again take up the right to control their own destiny. Partying in the street, cheering, flag flying, everybody smiling, hugging and kissing each other. Congratulations all round! We can breathe again. Noosa recently received a once in a lifetime opportunity to go to the polls and cast their vote to stay within the boundaries of the super city that is the Sunshine Coast or split and go it alone – back to previous Noosa Shire boundaries and personalised, community governance. This in itself was an incredible achievement, made possible only because of a dedicated and hugely passionate group of Noosa people who have worked tirelessly and diligently for 5 years to bring about this process. After that, it was up to the people of Noosa to decide, and decide they did! Everyone that loves and enjoys Noosa for what it is should be eternally grateful for their efforts. People power has spoken – it’s an amazing thing when it happens! Gives you the faith that if you truly believe in something and are passionate and focussed and dedicated to the cause – great things can be achieved and wrongs can be righted, even against huge odds. When Noosa and other Qld councils were forced to relinquish their right to govern themselves 5 years ago in an undemocratic act of breathtaking arrogance by the Beattie/Bligh government, Noosa said ….‘WE WILL NEVER GIVE UP!’ and they didn’t. Noosa along with Douglas Shire, Mareeba Shire and Livingstone Shire have all fought long and hard and have all now forged back the right to make local decisions for their local community and to manage their own destiny. They are not cities. They are all about community, not bureaucracy! Bigger is not always better. The road ahead to independence will certainly not be easy but the challenges in achieving local democracy will always be worth the effort so that we can return to genuine local decision making and community engagement, and all those people that love Noosa can continue to enjoy its unspoilt beauty and special charm now and forever. 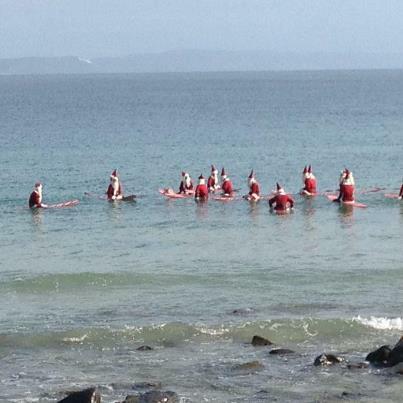 Christmas comes early to Noosa! Christmas came early to Noosa this year. To be specific it arrived at 10 am on Thursday the 6th of December via the Minister for Local Government. The Christmas present Noosa received is; a vote in March 2013, for the right to regain a Noosa Council. Noosa residents have finally received the opportunity to determine for all time Noosa’s future. In previous eras Noosa’s critical town planning (and all other council decisions) were controlled by their own local council made up entirely of Noosa people. Then, in 2008, against massive opposition the Queensland government brutally forced amalgamation on 97 local government areas including Noosa in the name of “cost efficiencies”. Noosa was forced to become part of the Sunshine Coast Council – a super city incorporating areas as far south as Landsborough, and areas such as Maroochydore and Mooloolaba which aspire to be cities in their own right and who share very little lifestyle values with the people of Noosa. The seat of council was relocated to Nambour and Noosa residents were hit with rate increases and loss of services and representation. Noosa has always chosen and fought for many decades for a different model. It is based around low level, low density development. It insists on round-a-bouts instead of traffic lights, and very subdued advertising signage. It has height restrictions of four storeys along Noosa Main Beach. It does its best to be a low stress area with minimal invasive city symbols ie. no parking metres. It is a place that has chosen not to become part of the mediocrity of urban sprawl that makes up so much of Australia. It is truly a special place and because of the community’s long-standing commitment to conservation, sustainable development and lifestyle protection Noosa is now a UNESCO-recognised Noosa Biosphere Reserve. Over decades the Noosa community has proven itself eminently capable of administering its own region. It has earned the right to continue to do so. This model is the reason visitors from across the globe are attracted to live and holiday in Noosa and this is the reason land values are amongst the highest in the country. Under the current amalgamated super council, Noosa is losing its way ….fast, unable to uphold the values and vision for which it has fought to retain for so long. So, thanks to some passionate, hardworking and committed local people, Noosa now has been given a chance to take control of its destiny once again. “After many years of effort we will get a chance to decide whether we want a local Council making local decisions after listening to what residents want.” “We will get a chance to vote against becoming a city, with high-rise, paid parking, over-development and the crime and congestion that go with it. “If the people vote in numbers of more than 50% in favour, Noosa may be able to reinstate a council which has over generations proven to be cost effective and visionary. If the people vote to stay part of the super council it will only be a matter of time before Noosa’s only 2 councillors are overwhelmed by the huge majority of councillors focussed on growth and development at all costs….and this special part of the world will soon become eroded and just another mediocre ‘suburbia by sea’. If Noosa people get it right in March, you and your family should be able to enjoy Noosa for generations to come. Merry Christmas Noosa! May all your wishes come true!